I love summer for many reasons—not the least of which is that it simplifies entertaining. In winter I feel that my guests must be rewarded for schlepping through the snow with warm, solid food and a relatively clean house. In summer I feel no such obligation. The weather and the sparkling conversation are my friends’ rewards for coming to visit of an evening. I tend to specialize in two types of summer evening parties. One is a dessert party, usually a sundae party. Guests help themselves to ice cream with a variety of toppings and chat as they juggle dishes, spoons, and smiles. The other is a cocktail party. I adorn the deck with a table topped with glasses plus wine, beer, liquor, ice, and soft drinks. (Fresh flowers help, too.) And I serve simple yet tasty appetizers. I don’t even have to clean the house before these parties because my guests won’t be inside! Even if you don’t entertain a lot, I suggest you try throwing a cocktail party—or even just a wine/beer party—or even just a lemonade party! Offer your guests something cool to drink and a light snack; then sit back and enjoy the long summer evening. 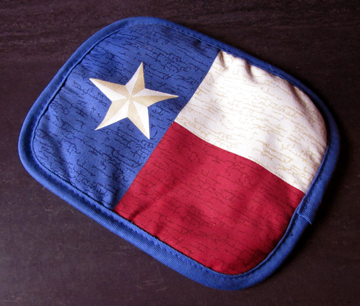 The appetizer recipe below comes from my friend Teri Tynes, a dyed in the wool Texan who now lives and writes in New York City. Teri makes her caviar look a lot prettier than mine by chopping everything up finely and arranging the dish artistically. Last time I made it I was in a hurry so my chopping was rough and my arrangement (pictured above) was … well, let’s just say it was free form. My guests loved the caviar anyway. In fact, my neighbor Alice took home the leftovers and ate them for lunch the next day. 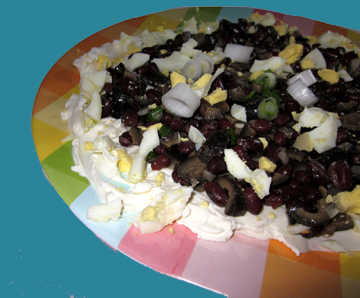 In a bowl combine all the ingredients except for the cream cheese, eggs, and scallion. Cover the mixture and let it marinate in the refrigerator for at least 2 hours. When you are ready to serve your caviar spread the cream cheese over the surface of a circular serving dish. Spread the bean mixture on top of it. Arrange the egg pieces in a ring around the edge of the plate (the effect is sort of that of a wreath). Sprinkle the chopped scallion overall. Serve with crackers or tortilla chips. Serves 8 to 12, depending on what else is on the table. This entry was posted on Friday, July 9th, 2010 at 4:00 am	and is filed under Appetizers. You can follow any responses to this entry through the RSS 2.0 feed. You can leave a response, or trackback from your own site. I was confused, as I read the recipe several times looking for the caviar!! Here is a recipe with caviar (or you can use lumpfish row for a budget version!) Butter some brown bread and cut it into squares, Put smoked salmon on half the squares, and caviar on the rest. Garnish with lemon and lime zest. Arrange in a chequerboard pattern. Jean, it IS good. Frayed, I like your checkerboard idea! I hope you finally figured out that this is a faux caviar. It has the advantage of lasting a lot longer than the real thing! Wow. I remember this now. Thanks for sharing! I haven’t made it with olives or eggs in a long time or even bothered with the cream cheese. I serve it with chips. 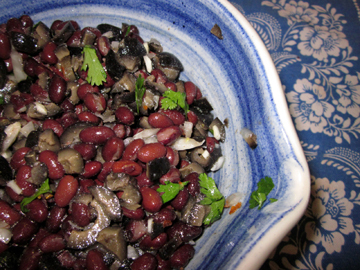 Scallions, beans, lime, cilantro, and the seasonings are critical, and I leave it in the fridge overnight. My New Yorker friends like this stuff. I agree that the eggs aren’t really necessary, and I prefer to serve the cream cheese on the side so one can use as much or as little as one likes. But I’d revisit the olives, Teri. Of course, I may be prejudiced because I love olives in all forms, but I think they add a fruity flavor and texture to the beans. Ooohhh, can I come to a sundae party? 🙂 And my mom used to serve something called ‘Georgia Caviar’ that was very similar to this.. never heard of anyone else doing it until now-I love it!